An important new guide to flexible empirically supported practice in CBT. There is a growing movement across health care to adopt empirically supported practice. Treatments for Psychological Problems and Syndromes makes an important contribution by offering a comprehensive guide for adopting a more flexible approach to cognitive behavioural therapy. 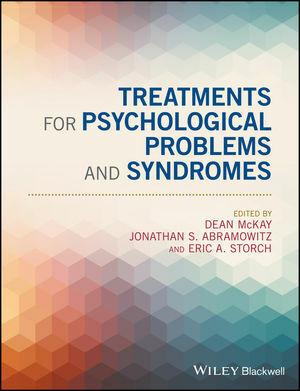 Edited by three recognized experts in the field of CBT, the text has three key aims: firstly to identify components of models describing specific psychological conditions that are empirically supported, poorly supported or unsupported; secondly to propose theoretical rationales for sequencing of interventions, and criteria for moving from one treatment procedure to the next; and thirdly to identify mechanisms of psychological syndromes that may interfere with established protocols in order to promote more informed treatment and improve outcomes. Written in clear and concise terms, this is an authoritative guide that will be relevant and useful to a wide range of readers from beginning clinicians to experienced practitioners. Dean McKay is Professor of Psychology at Fordham University, Adjunct Professor of Psychiatry at Mount Sinai School of Medicine, and a Past President of the Association for Behavioral and Cognitive Therapies (2013-2014). He is also a clinical psychologist and co-directs the Institute for Cognitive Behavior Therapy and Research, a private group psychological practice. Jonathan S. Abramowitz is Professor and Associate Chair in the Department of Psychology and Neuroscience at the University of North Carolina – Chapel Hill, and a clinical psychologist in private practice. He is a Past President of the Association for Behavioral and Cognitive Therapies (2014-2015), and Editor-in-Chief of the Journal of Obsessive-Compulsive and Related Disorders. Eric A. Storch is the All Children's Hospital Guild Endowed Chair and a Professor of Clinical Psychology in the Departments of Pediatrics, Psychiatry & Behavioral Neurosciences, and Health Policy & Management at the University of South Florida. He is a licensed clinical psychologist and serves as the Clinical Director of Rogers Behavioral Health – Tampa.